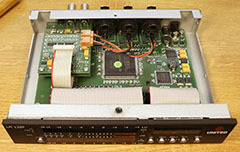 This PPM (Peak Programme Meter) and Loudness Meter was a joint development with Estec GmbH. It is designed for professional use, mainly in radio and television studios and used by well-known broadcasting organisations. The LM 128P still contains part of the "DNA" of the DPLCMs, but has undergone significant further development and redevelopment. Even now, an FPGA is the core of the device. In a further development a vertical version of the LM 128P, the LM 128PV was designed. Originally, the LM 128P was created under the name LM 1128 as a pure loudness meter, but with 6 channels for surround sound. The combined version as stereo PPM and loudness meter was then more successful. I don't want to withhold a glimpse inside from those interested in technology either. Unfortunately the company Estec does not exist any more, but I still have some of these devices. Also I take over the service for the delivered devices (but that was not necessary so far). For more information please refer to http://tech.ebu.ch/loudness. 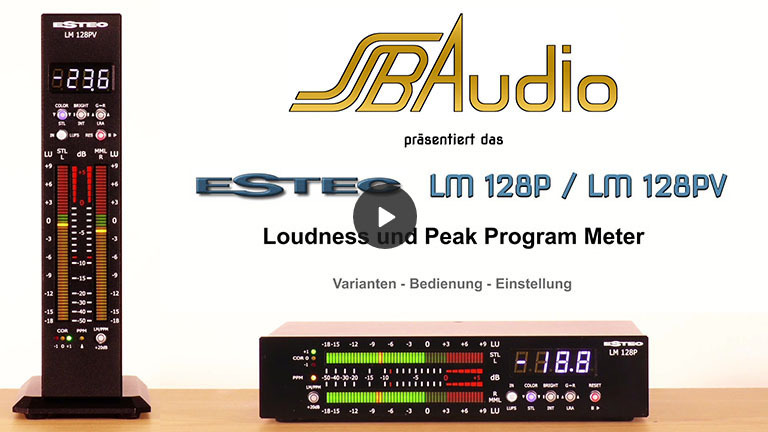 Note: The LM 128P does not incorporate a true peak meter according to EBU R 128. Key +20dB: Adds 20 dB to the measured PPM value. Also: Selection between Loudness Meter (LM) display mode and Peak Program Meter (PPM) display mode. Key LUFS: Selection between LU (relative to a reference level) and LUFS (absolute to full scale level). Also: Selection between AES/EBU, SDI and analog inputs (if available). Keys STL, INT and LRA: Selection of the 7-segment display: Short Term Loudness, Integrated Loudness or Loudness Range. Also: Setup functions. Keys RUN/PAUSE resp. RESET: Start, Stopp resp. Pause as well as resetting the Integrated Loudness and the Loudness Range measurement. This is an AES/EBU resp. AES3 input. With a matching adapter also AES3id (BNC) or S/P-DIF (RCA) signals can be applied. 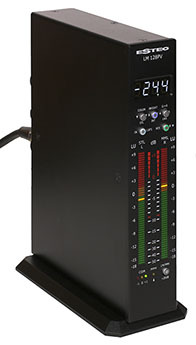 The optional 3G-SDI input/output provides a 4 stereo channel audio de-embedder for data stream 1. These 4 stereo signal pairs can be selected to be measured. The green LED „LOCK“ will be on, when a valid SDI signal is detected. For all other sample rates the filter coefficients of the closest known frequencies are chosen. An optional analog stereo input is available on two XLR jacks.